What a cool, fun mug! It is available in three colors, and I chose the red one. When it arrived it looked like a well made but unspectacular ceramic mug in a pretty red color with darker red writing on the side that didn’t really stand out. But when you add a hot beverage, the magic happens. The writing turns from a dark shade to white and really stands out against the body of the mug. 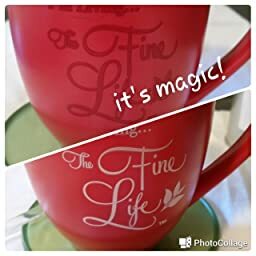 The writing on the magic mug changed color from the bottom to the top. It made me smile watching the words begin to stand out until the entire phrase was clearly visible. The font and design are strikingly beautiful. The color change lasted throughout my cup of tea. I made another cup later in the day, and then I had coffee. The effect worked well each time, and once the mug returned to room temperature, the writing slowly faded back to the darker color. To keep the color-changing effect, it is recommended that you hand wash this mug. I was happy to see that my tea and coffee did not stain the white interior of the mug, and it washed easily with soapy water and was ready to use again. The mug is thick and strong and can hold up to 14 ounces! It came in a nice box suitable for gifting. I knew I liked this company right away when I opened the mug and saw a notecard on top with an adorable photo of what I can only assume is the owners’ dog. I love my dogs more than anything, so this made me smile.